Empowering Black students to become change makers is a key goal of the book, Teaching for Black Lives. Editors Dyan Watson, Jesse Hagopian and Wayne Au have assembled a cogent group of essays that offer the opportunity for developing an anti-racist pedagogy. 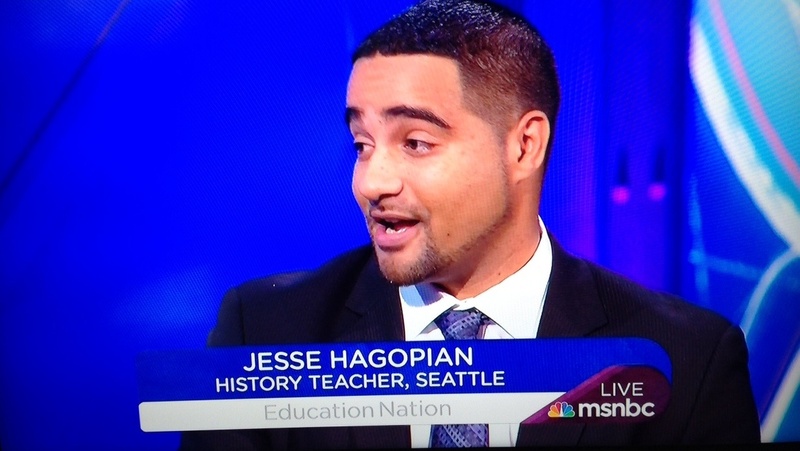 Truthout interviewed one of the editors, Jesse Hagopian, who is also a Truthout contributing writer. Mark Karlin: You note in your introduction that “We must teach for black lives in our classrooms.” How did you and your fellow editors come up with the idea for a textbook that can also be used as a reader by adults? Jesse Hagopian: As I answer these questions, white supremacists and neo-Nazis are readying plans to march on Washington, DC. Hate crimes are on the rise around the country. Police violence against Black people continues unabated and the school-to-prison pipeline is helping to fuel the nation’s system of mass incarceration. And yet, there are also a growing number of educators who are organizing and fighting back against anti-Black racism. In this way, I think the Black Lives Matter (BLM) at School movement and the broader movement for Black lives inspired the idea for Teaching for Black Lives as a book that could be used by educators, students, activists and community organizers. The BLM at School movement went national during the 2017-2018 school year and educators in over 20 cities participated in a week of action from February 5 to 9, to affirm the lives of Black students and challenge institutional racism. The BLM at School movement developed three demands: (1) End “zero tolerance” discipline and implement restorative justice; (2) Hire more Black teachers; (3) Mandate Black history and ethnic studies in K-12 curriculum. In addition, educators taught lessons throughout the week that corresponded to the 13 guiding principles of #BlackLivesMatter Global Network including restorative justice, empathy and loving engagement, diversity and globalism, trans-affirming, queer-affirming, collective value, intergenerational, Black families and Black villages, Black women and unapologetically Black. Seeing this movement spread from Seattle to Philadelphia during the 2016-2017 school year, and then explode nationally the following year, made the editors at Rethinking Schools want to find ways to contribute and arm teachers with lesson plans that can help them empower students to become change makers. I was truly blessed to be able to work with co-editors Dyane Watson and Wayne Au on this project whose expertise in anti-racist pedagogy was invaluable. How did you decide on the five sections of the book? Teaching Blackness, Loving Blackness and Exploring Identity. As well, we paid special attention to the fact that while the Black experience is shaped by the impact of racism, there is no one Black identity. Because of this, we include lessons in the book that take up many different intersectional Black identities, including Black Women, Afro-Mexican, Black Muslim and Black queer identity. These lessons will help educators better understand intersectional Black identities and the overlapping forms of oppression—such as sexism, homophobia, Islamophobia and xenophobia—that these students face. Likewise, how did you decide on the authors of the many essays? The teaching pieces included in Teaching for Black Lives represent the vast body of work that we have collected from authors who have published with Rethinking Schools magazine and other important essays and interviews that we believe would help explain the major themes we address in the book. In one chapter, longtime educator Jody Sokolower interviews Michelle Alexander, author of The New Jim Crow, about the roots of the school-to-prison pipeline. We learn in an interview with author Monique Morris that stereotypes of the “angry Black girl” have contributed to Black girls being the most disproportionately suspended and expelled from school. In another chapter, author, poet and sociologist Eve L. Ewing vividly describes the horror of mass school closures in Chicago and how the powerful forces of desire and imagination can be used in the battle against the neoliberal assault on the public schools. We reprinted a powerful speech by James Baldwin entitled, “A Talk to Teachers,” where he insists, “It is your responsibility to change society if you think of yourself as an educated person.” In a chapter on how racism is infused in responses to natural disasters, author and educator Renée Watson shows teachers how to use poetry to teach about Hurricane Katrina, the earthquake in Haiti and the San Diego wildfires of 2007. I co-authored a teaching activity with educator Adam Sanchez where students take on the role of different members of the Black Panther Party—as well as people who tried to get rid of the Party—and meet each other in a large gathering where they discover there was a lot more to the Panthers than they were ever taught before. We only included teaching activities that had actually been used by educators in the classroom because we believe that the best lessons are created when educators critically reflect on their own work. We also paid special attention to including artwork and poetry that could bring the writing to life. Throughout the book, we have included stunning graphics in full color, often original art pieces, by Black artists around the country whose work makes up a vital component of the book. The beautiful cover illustration by Ekua Holmes has become what I imagine freedom to be when I close my eyes. As a teacher, how do you find Black students respond to the groundbreaking book? I taught ethnic studies during the 2017-2018 school year, the first ethnic studies class in the Seattle public schools. The creation of my class was one of the important victories of the Black Lives Matter at School movement in Seattle and gave me a great opportunity to use many of the lessons that are included in Teaching for Black Lives. Lessons on identity that helped my Black students celebrate their intersectional Blackness were a true joy to see in the classroom. For example, students were amazed to learn that it was a gay Black man, Bayard Rustin, who had organized the March on Washington, and that by the 1970s, Black women made up the majority of the Black Panther Party. The lessons that revealed the school-to-prison pipeline, especially the essay written by high school student Haniyah Muhammad about her experience growing up with a father in jail, were deeply meaningful for my students as well. One of the lessons that was most engaging for my Black students was, “COINTELPRO: Teaching the FBI’s War on the Black freedom movement.” In this activity, students become investigators themselves trying to unearth the motivations and strategies that were used to put so many freedom fighters in the grave and disrupt the many different organizations that made up the social movement against racism in the 1950s, 60s and 70s. I found almost all of my students had never even heard of COINTELPRO and were shocked to learn that this organized attack by the government was not just against the Black Panther Party or the Nation of Islam but also against avowed nonviolent leaders such as Martin Luther King, Jr.
Why is it important for whites to read this book? White teachers make up the vast majority of educators in the US—especially since some 26,000 Black educators have been pushed out of the profession around the country since 2002. If Black students are going to get the curriculum they deserve—a curriculum that humanizes and empowers them to challenge anti-Blackness—it will require a lot of white educators taking the time to educate themselves and making a commitment to antiracist pedagogy. For that reason, it is critical that white educators engage with the ideas and lessons in this book. In addition, Teaching for Black Lives is a valuable book for white students who also desperately need to be taught the truth about Black history and better understand the ways racism is constructed in our society to divide them from their Black peers and thus keep them all disempowered. White students need to better understand the struggles and contributions of Black people throughout history, as well as intersectional Black identities, if they are going to be effective allies in the struggle for racial justice. Can you tell us more about the organization that published the book, Rethinking Schools? Rethinking Schools has always had a commitment to defending the public school from corporate education reformers who seek to profit off of the public schools with privatization schemes such as vouchers and charter schools or use high-stakes standardized testing to punish students and teachers. At the same time, Rethinking Schools has always realized that the ideal of the public schools as being a great democratizing force in society has always been stunted by the realities of structural racism and oppression that often get reproduced in the education system. Insightful books, DVDs, and other products hand-picked weekly by Truthout staff. By purchasing a Progressive Pick you are supporting Truthout’s non-profit mission. A revolutionary transformation in teaching subjects relevant to Black history in the United States. Much needed in all school districts, and a vital book for Black and white American adults too.